Interior latex paint dries to the touch quickly -- usually within an hour. It can take weeks, however, to cure to its final hardness. Cleaning or washing uncured painted surfaces can mar the paint. In some cases, it never completely cures, leaving you with sticking doors, windows or shelves. This is called "blocking" and is usually caused by applying paint too thickly, or applying several layers without allowing enough drying time in between coats. Several factors affect latex paint curing, and you can speed the process. Latex paint can take weeks to cure inside. Take the color and sheen of the paint into consideration. Dark colors with a lot of pigment and higher gloss paints both take longer to cure than light-colored, flat or low-luster paint. Apply paint in two or more thin, even coats instead of one thick coat. Follow the paint label directions for recommended drying time between coats. Typically you should allow at least two hours; longer if it is cool or humid. 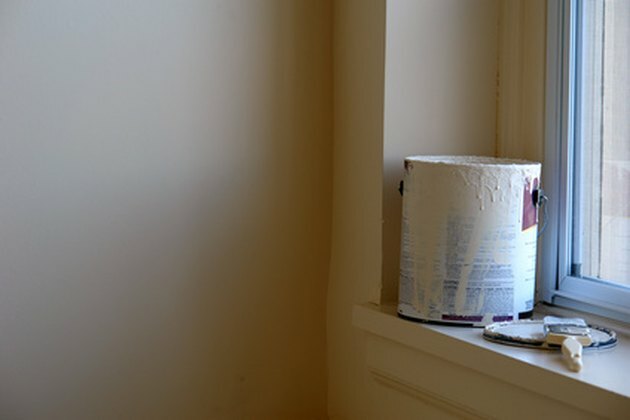 Keep windows open for cross-breeze and ventilation as much as possible for two weeks after applying the paint. If the air is very still, use a fan. Air movement helps paint dry and cure faster. Run the air conditioner or use a dehumidifier if humidity is high. The lower the humidity, the faster latex paint will cure. Use heat to keep the air temperature above 60 degrees Fahrenheit. Paint cures faster when it's warm.